Kakao, the Korean maker of mobile focused WhatsApp-like VoIP app Kakao Talk, has announced a significant deal with Yahoo Japan which sees the two firms club together to promote and market the service, which it says has 65 million global users, in Japan. Rival Line, which recently passed 60 million users at a rate of 5 million new sign-ups per 3 weeks, is the dominant player in the Japanese mobile messaging space but Yahoo Japan — which itself is a joint-venture between Yahoo Inc and operator Softbank — is aiming to bring greater competition, and new monetization streams, by promoting the Korean app through its popular and visible services. Yahoo Japan is buying into Kakao Japan, the existing Japan based subsidiary, and the investment will see both sides take 50 percent stakes in the business. “The deal will help increase the smartphone penetration rate in Japan and combine Kakao’s mobile expertise with Yahoo Japan’s userbase and profile,” a Kakao representative told The Next Web. The companies have confirmed that they have plans to expand to offer additional services in due course, although further details of that are not being divulged for now. It’s interesting to see this deal struck as mobile messaging apps are increasingly popular, particularly in Asia, where they are rivalling established social networks for attention on smartphones. The coming-together is a significant one for Kakao Talk, which has so far failed to replicate its success in Korea overseas, and it can look forward to a massive boost. Yahoo Japan is the country’s top news portal, and search firm, bringing in 2.3 billion page views per day, as Serkan Toto points out, and already the news is the talk of Twitter in Japan. For Yahoo Japan, the deal is another piece of its growing mobile content strategy, and, in the announcement, the company cites the growth of smartphone and device-based services — such as Twitter and Facebook — as examples of new business opportunities and consumer trends. Just last month, Yahoo Japan forked out $12.8 million to buy mobile content startup Community Factory– maker of popular photo app Decopic — as part of new CEO Manabu Miyasaka’s goal to strengthen the company’s mobile and social footprints. Toto, an analyst who closely follows Japan’s Web and mobile trends, believes the coming-together is a match “made in heaven” that was much needed for Kakao. 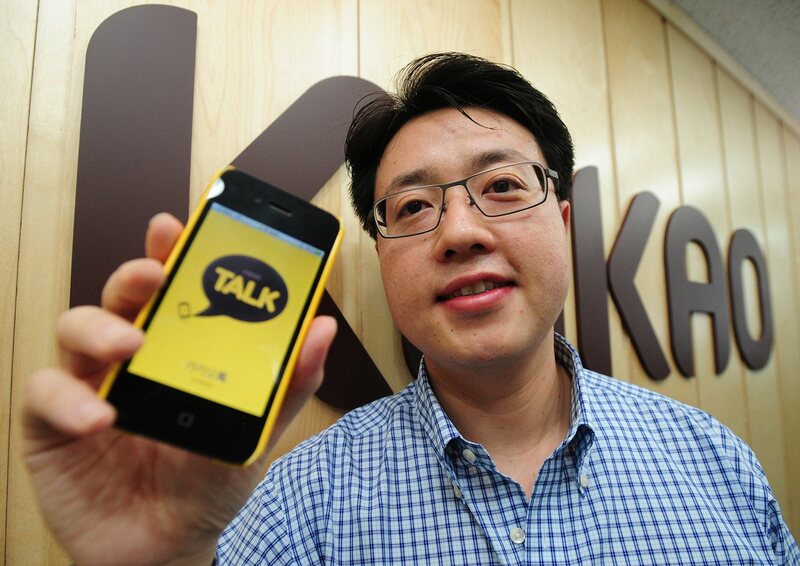 Kakao Talk makes its money through the sale of virtual content and opt-in advertising for businesses. The startup was recently reported to have attracted the interest of Korean Internet firm SK Communications — which runs popular local social network Cyworld — however a Kakao spokesperson rejected the rumor when contacted by TNW. Kakao Talk has a reported 90 percent attachment rate in Korea’s growing smartphone market — which numbered 30 million devices as of August — and it will be interesting to see whether Line makes a move to defend its home territory. The startup recently boosted its presence through a tie-in with operator KDDI. Though clamshell-style Web-enabled feature phones are still popular, smartphone ownership is growing in Japan. Research from comScore suggests that Android leads the way, accounting for 68 percent of the estimated 24 million smartphones there. Though Yahoo Japan is independent to Yahoo Inc, the ‘Big Y’ has been busy in Asia today, where it announced plans to withdraw from South Korea this year.